IT is the rematch that nobody wanted. With the Brexit referendum at the forefront of most people’s minds, the run-up to the Spanish general election has almost slipped under the radar. But it is upon us and if Britain votes to Leave the EU on Thursday, then the future of hundreds-of-thousands of expats and Gibraltarians will rest on who gets voted in on Sunday. 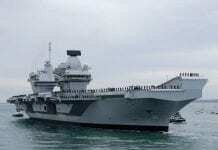 The ruling PP party has already threatened to pounce on Gibraltar ‘the day after a vote for Brexit’. Meanwhile acting Prime Minister Mariano Rajoy has warned that British expats could lose the right to live and work in Spain, should Britain opt out. There is no doubt that the outcome of the referendum will – and already has – had an impact on the campaign strategies of Spain’s politicians. Calls for Gibraltar’s sovereignty and threats to the expat population drum up patriotic support for the PP politicians who are willing to replace manifesto pledges with knee-jerk rhetoric to drum up votes. And if Britain votes Leave on June 23, then those same threats will be ramped up in the three days before Spain goes to the polls. But how likely is it that a re-run of December’s election will produce a government? Well, not very likely, but slightly more so than before. For much of the six months since the initial election took place, the country’s four main parties have been locked in a political stalemate. The main change took place last month, with new kids on the block Podemos teaming up with Izquierda Unida to breathe new life into Pablo Iglesias, the forgotten man of Spain’s political makeup. Under the new name of Unidos Podemos, the alliance has also garnered the support of several other minor left-leaning parties. And, according to the latest polls, the pact is popular with Unidos Podemos standing to get around 25% of the vote – a whopping 5% more than the Pedro Sanchez-led PSOE which stands to take 20-21%. The PP still looks on track to take the majority of votes but is even less likely to be accepted into a pact after the election – which is almost certain to throw up another split vote. A full body triple assault on the acting Prime Minister was witnessed by the nation as the country’s first ever four-way political debate played out on TV last week. 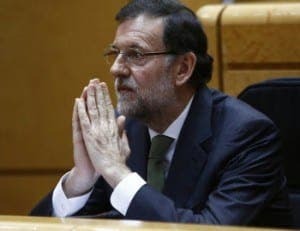 Pablo Iglesias, Pedro Sanchez, and Albert Rivera of Podemos, PSOE and Ciudadanos, respectively, attacked Rajoy on the country’s rampant corruption and the stagnant economy. Rajoy contended that the problems Spain faces are ‘easily seen, but not easily solved’ but his whipish defence would largely have fallen on deaf ears considering the obscene number of corruption scandals laid at his party’s feet. In the six months since the last election, the PP has been dragged through the mud. In January, it became the first Spanish party to ever be judicially charged in a corruption case, being accused of destroying disgraced politician Luis Barcenas’ hard drives which allegedly contained information on illegal party funding. The same day, a staff member of deputy PM Soraya Saenz de Santamaria resigned after being linked with the fraudulent awarding of public contracts. By February, the scandal spread to Madrid after the Guardia Civil was sent to register the PP headquarters as part of the ongoing investigation which involved illegal financing and kickbacks. Esperanza Aguirre, former President of Madrid from 2003–2012, resigned as regional leader on February 14. The Panama Papers further shamed the party with Industry Minister Jose Soria forced to hang up his expenses book in April. 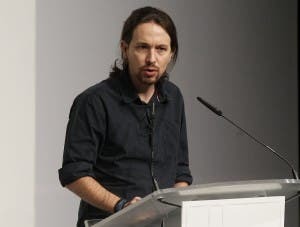 The attack on corruption within the political sphere has been spearheaded by pony-tailed Podemos leader Pablo Iglesias for the best part of two years. A man inspired by cultural icons, the contents of his office says as much about him as you need to know. A Che Guevara poster, a painting of Khaleesi from Game of Thrones and a biography of Latin American independence hero Simon Bolivar point to a man inspired by fighting corruption. 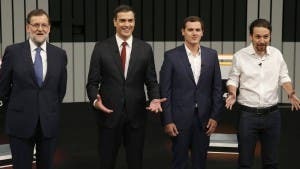 However, whether or not the PSOE and Unidos Podemos can come together after the June 26 election and form what would essentially be a three-way government remains to be seen. It certainly didn’t happen last time, but unless Ciudadanos make an unlikely u-turn and get in bed with Rajoy and co it is the only likely outcome for a ‘stable’ government. 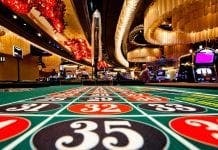 What are the odds on a third election? The article does not say anything about this, simply because no one knows. Bit of a waste of time writing the article really. What has Pablo’s hair got to do with his politics Rob? How about grey-bearded Rajoy? You missed a trick there. On the one hand we can assume an air-head hippy and on the other a wise old statesman? Lazy cliches, leaving the reader to join your unspoken dots.